On September 14, the new 2017-2019 training course in the Agro-Food Marketing has been presented. During the press conference held at the ITS Foundation’s headquarters at the “Parco della Scienza” in Teramo, the video produced by Pikit for the Institute was officially presented. 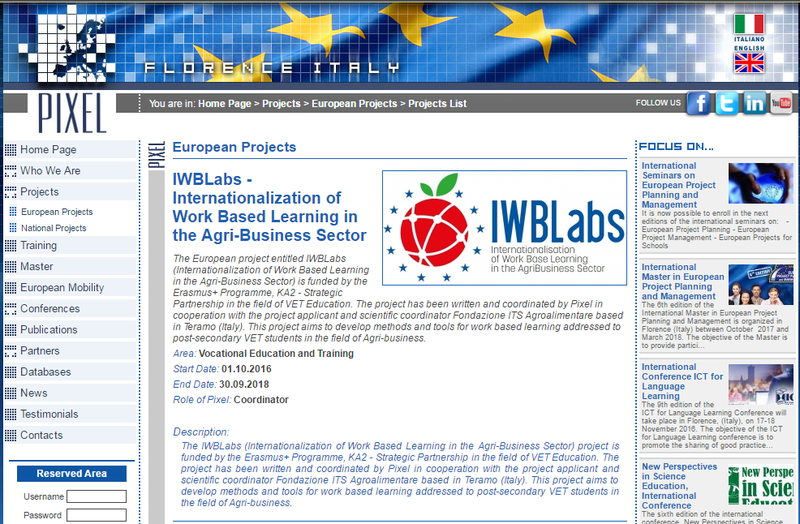 The European Project entitled IWBLabs (Internationalization of Work Based Learning in the Agri-Business Sector) becomes real, the project aims to increase synergy between agribusiness companies with training and learning activities. Leaders of the project is Pixel together with Fondazione ITS Agroalimentare based in Teramo (Italy), who is project applicant and scientific coordinator. The project target is to develop methods and tools for work based learning addressed to post-secondary VET students in the Agri-business field. Here are some shots from the backstage shooting during the production of the video clip titled “naufragando” performed by the band management del dolore post-operatorio directed by Ivan D’Antonio for a Stratostudios production. This is the visual material designed for the Abruzzo Open Day in the Valley of the Abbeys, a touristic event to be held from October 29 to November 6, 2016 in the province of Teramo. For our client we designed the poster and the image to be used as cover of the facebook page. For the Bibliopride 2016, a national eventorganized by Associazione Itliana Biblioteche this year we opted for a colored graphic design. The visual communication campaign of the event that took place in Naples on October 1 was disseminated on posters and postcards designed by Pikit. The new website designed and developed for Maple And Saffron is online. The client is a tour operator based in Halifax (Canada) which offers touristic services in Abruzzo, Itlay. Pikit has created a brand new website with a totally new look to meet the most recent web design trends. The website has been developed to be updated directly from the website manager through a wordpress CMS and it’s been designed to be browsed correctly on any kind of device, including tablets and smartphones. The website has been enhanced with a tool by which the user can easily build a fully customized tour by a drag and drop system and get a quote request. Graphic design of a flyer for our customer Centrufficio located in Teramo. Our customer requested us to design an advertising flyer to be spread both by traditional mail and by e-mail. (Italiano) Che differenza c’è tra sito web responsive e sito mobile?